On Saturday 6 May, crews of two World Cruising Club rallies waved goodbye to the Caribbean shores of Tortola as they set off for their offshore adventures as part of the 2017 editions of ARC Europe and ARC USA. Run concurrently, these rallies are taking some crews homewards and others to new cruising grounds. 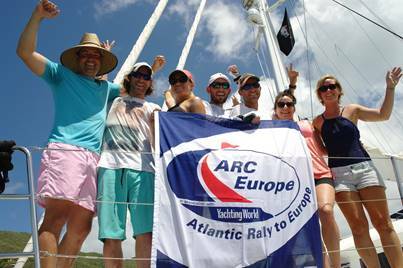 Venturing west to east across the Atlantic, twenty-six boats will sail with ARC Europe this year; twenty-three departed from Nanny Cay, Tortola in the British Virgin Islands on Saturday morning, and they will be joined in Bermuda by Viva sailing from Portsmouth, Virginia, USA and three other boats who will join the rally from there. Allowing time to experience the build up to the highlight of this year's competitive sailing calendar, the America's Cup, crews will enjoy an extended stopover in Bermuda, before continuing their ocean adventure to Europe and cruising through the mid-Atlantic Azores archipelago en route. 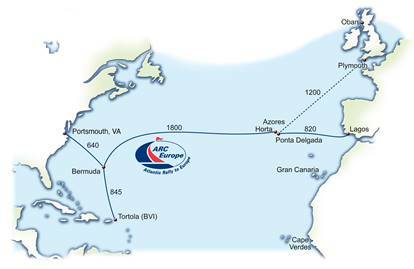 As part of ARC USA, eleven boats sail alongside the ARC Europe fleet to Bermuda, and then onto the US East Coast whilst five boats elected to sail from Nanny Cay directly to Fort Lauderdale, Florida, via the Old Bahama Channel. Prior to departure, Nanny Cay Marina hosted the fleet for a week long pre-departure programme covering safety demonstrations, crew briefings, onboard equipment checks and socials evenings ashore. A few of the boats were berthed on the marina's brand new docks, recently installed as part of the outer marina development. Eventually 120 new slips will be added to the marina together with residential buildings, as part of the ongoing project. "Nanny Cay Marina is hands down THE best marina I have ever stayed at so please keep up the good work!" said Tanya Adam from yacht Yoda. "It's clean, the showers are like being at a spa, there's a pool and a beach just a stone's throw from each other. The ARC staff have been fantastic too; They have planned everything out so well and it has all gone down a treat and I'm not just talking about the rum punches." As start day rolled around, crews were greeted with blue skies and 15 to 18 knots of wind from the east giving ideal conditions for a downwind departure. Lines were slipped to the sounds of a local steel pan band providing a fitting end to their time in the Caribbean. Leading the fleet across the start line was British-flagged Dufour 560 Pure Elegance, followed by Yoda and Franny B chased down by the smallest boat in the fleet, Anakin, a Comfortina 32. ARC Europe and ARC USA fleets shared the start line and the bumper turnout of 38 boats provided quite a spectacle for the onlookers on shore. 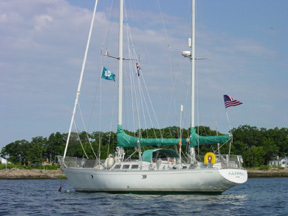 Within the group, Starblazer was one of the last to head out of Nanny Cay. John and Joyce Easteal have been part of the ARC family since 2009, first sailing an Atlantic circuit and then going on to circumnavigate with World ARC from 2014-2016. Last year, they joined ARC USA to explore America's east coast, but they have final turned for home and ARC Europe will be their swan song before moving ashore. "The excitement and anticipation of our travels ahead, towards Bermuda, onwards to the Azores and finally home to Portsmouth Harbour, England, is tinged with sadness. We have said goodbye to the Caribbean islands for almost certainly the last time. When we left with ARC Europe in 2010 we were already planning a return with, hopefully, a bigger boat. The plan came to fruition when we bought Starblazer and returned to the Caribbean and onwards around the world. Now we have to make plans for different sailing destinations!" Joyce wrote in the boat's blog from onboard. Amongst the fleet are a number of other familiar faces from ARC's past, including four boats returning to the USA after sailing to the Caribbean with the ARC Caribbean 1500 last November, and eight boats from 2016 editions of ARC and ARC+. New faces have been warmly welcomed, including the crew of Jura, a Nordhaven 57, who is the only motor yacht taking part. The fleet will keep in touch whilst at sea on the SBB radio net, and each day they'll received position reports and routed weather forecasts from World Cruising Club's Rally Control. Each yacht is also fitted with a YB Tracker so those at home can follow the fleet online via the website and YB races app. Those sailing to Bermuda with ARC Europe and ARC USA are expected to arrive in St. Georges, Bermuda in 5-7 days' time and will be sure to enjoy a few customary dark n' stormy drinks on arrival. During the stopover, they will take time to explore the island and see the build up to the 35th America's Cup before ARC USA yachts depart for the US east coast. On 17 May the ARC Europe fleet restart for Leg 2 sailing approximately 1800nm to the famous mid-Atlantic rendezvous point of Horta in the Azores. Rather than sprinting across the Atlantic, the rally visits three of the islands over a 12 day period, with the option of visiting a fourth. After almost two weeks cruising the Azores archipelago, boats either sail on with the fleet to Marina de Lagos in Portugal, or make their own way north towards the UK and Ireland. ARC Europe will come to a close with a final prize giving ceremony in Lagos on 18 June 2017.